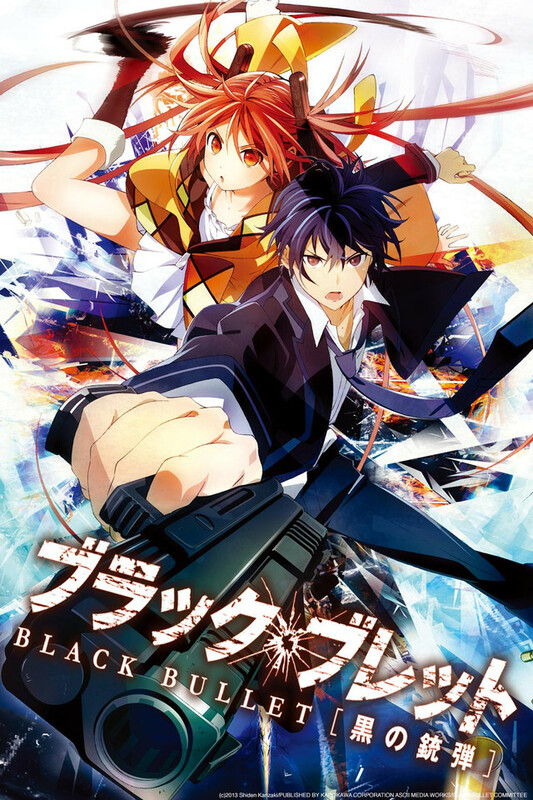 Black Bullet premiered on 8th April, 2014. This is a post-apocalyptic (maybe even during the apocalypse in a way) anime TV series which focus on the survival of humanity and the way it evolved just for this goal. Many clashes, ruthless battles and a lot of fun is what follows after a devastating attack from a different species. Graphics and music in the show are somewhat mediocre and the digitally drawn monsters sometimes get in the way of enjoyment. Nonetheless, there are many things I liked about it, which is something strange as the show was basically nothing too great. The world was attacked by Gastrea – a parasite-type virus which infected the whole Earth. Due to this virus, children infected with it started being born. Unlike with males, however, girls lived and also became superhuman. Humanity outcasted them and named them the Cursed Children. These young girls work for the Civil Security organisation as Initiators. Their partners in fighting the Gastrea-infested world are humans, mostly grown-up males, who are called Promoters. We see how the young Enju meets her Promoter – Rentarou and how they manage to battle against the worst enemy our planet has met. Volume 6 of the novels: Shoma Nagisawa and Midori Fuse. These two became the couple in the show that was there for the least time and influenced the entire story line. I was very interested to see how the show will manage to express the emotions and the dreadful reality that each young girl has fallen into. Well, they did it well. For all the fans of boobies, tight skirts and heavyweight thighs: this is not the type of show you will like. The worst part (best for the lovers of the genre) in the story, the one where nothing seems quite adequate is when they try to pull-out a rabbit out of their hat and do a semi-stable loli-harem for the young promoter. Apart from the two main characters, we are able to see from the point of view of even the most unimportant of the others. We even manage to know the lives of a dozen young students who appeared for roughly seven minutes int he whole season. The two most interesting side-stories for me were the background of the woman behind Enjou and Rentarou’s home organisation – Kisara Tendou. Her life seems to be in no better state than the ones of the Gastrea girls. Nonetheless, she combines regular dialysis hospital hours with managing the Tendou Civil Security. On top of this, we know that she is at least at the level of a Promoter and can handle an Initiate without a problem. Sadly for me, the story of how she became the president of the Civil Security organisation and her family background were not expanded enough for me. Here we see Kagetane when he infiltrated the meeting when a very important task was assigned to the main duo. Naturally, no one saw hm come and no one could stop him go. The second secondary story I enjoyed was the constant appearance of Kagetane Hiruko. Yes, he’s that character with the mask, the hidden identity and the similarities to a certain Tuxedo Mask. Kagetane first appears against the main duo and flattens them out. He’s ruthless, charming and at the same time incognito. His own story is anime-worthy. The drama was revealed bit-by-bit and the suffering even had its own peak in the story. Let me tell you that such a straight-line plotline is what I have been looking for a long time. If you like to have an easy night-out with a recent show, I will tell you to watch Black Bullet. I really enjoyed your preview, as always. What I disliked her was not the little brave loli girl, but her typical shounen master – weak, whiny and insecure. Shoma was actually the hero that simply had to “go away” in order to keep the protagonist somewhat likable. The weakest decision plot-wise, I would say. Kagetane’s change of heart was also very unexplicable. Still, this always happens in anime adaptations, so it cannot be treated as a major flaw. I am afraid there are such things even in the novels, though. Not as drastic, of course and definitely not as rushed as in the adaptation, but they are still there. The shounen-type “hero” is one thing you get in every retelling of this story. I absolutely love your review. The show was simple, moe, tsundere, lolli AND action. I think it should serve as an example on how to combine all these and still create something watchable. Thank you for the kind words and I am happy you enjoyed it too. I have been left with the impression you don’t really like many of the newer titles.